The Tomahawks will play one more exhibition game before the regular season beings. 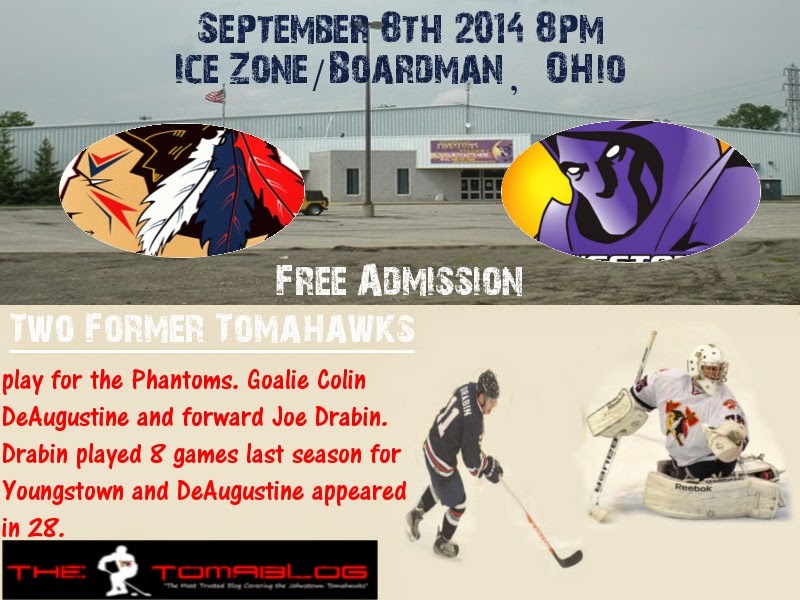 The team will travel just outside of Youngstown, Boardman, OH, on Monday September 8th 2014, to take on the Phantoms. The game is to get underway at 8pm and is open free to the public. If you have a chance to catch the game you'll be in for a treat. Not only is free hockey great, but it's also a chance to see how the Tomahawks stack up against a tier one team (NAHL and the Tomahawks are tier two). If the Tomahawks can hang with the Phantoms, even win, that'll give them some extra confidence heading into regular season play. If they can beat a higher level team, that will just speak for itself about the talent Johnstown has this year. It's also not a concern if they lose. It'll be a chance to learn how to play against a quality team and at a very fast past speed, something Johnstown needs vs teams like the Keystone Ice Miners and the Michigan Warriors. This Friday we'll take a look at this last exhibition game further and get you ready for the action, though the only way to see the action is to be there in person. We plan to be, and will do our best to keep everyone back in Johnstown updated with the game scores and notes. If you are headed to or are thinking about going, here's some directions from the War Memorial to the Ice Zone. Sadly this game isn't being played at the Phantoms regular season home, the Covelli Centre, which looks somewhat like a mini Concol Energy Center. Oh well, maybe next time. P.S. Do you have an extra $2.2 million dollars laying around? If you do the Ice Zone is currently for sale.